Not everyone knows what a tragus piercing is, but piercing enthusiasts definitely do. 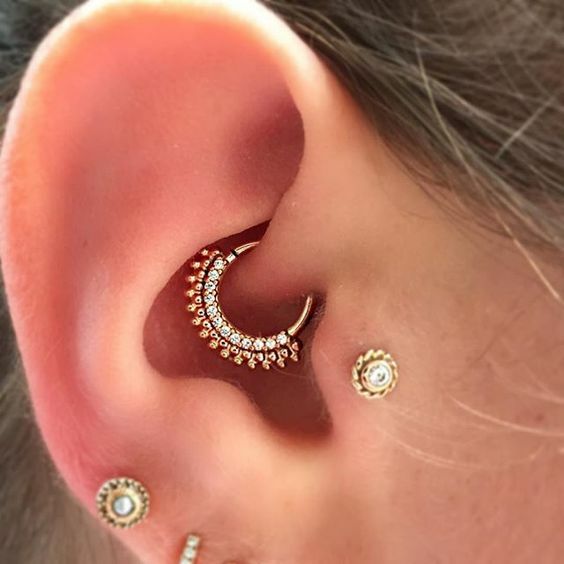 It is one of the most unique ear piercing known to the piercing world. However, no matter how beautiful it is, the tragus piercing is not all glitz and glamour. You would have to make sure to take care of it and see to it that it heals perfectly to make sure that you will avoid infections and risks that we will be talking about today. 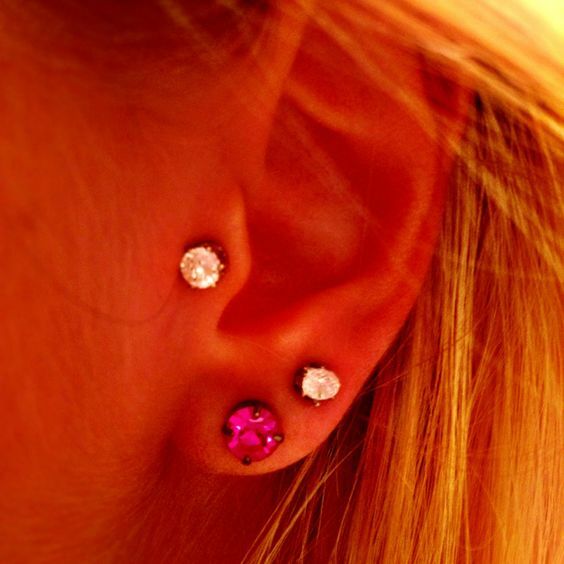 3 Is the Tragus Piercing Pain Tolerable? 4 How Can I Lessen the Tragus Piercing Pain? 5 How Much will it Cost me to Get a Tragus Piercing? 7 When will my Tragus Piercing Heal Completely? 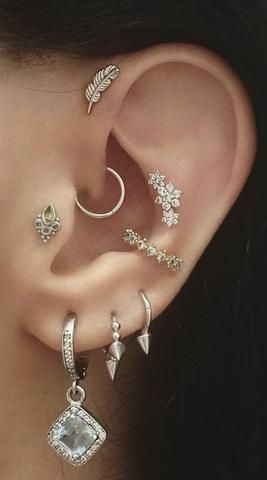 9 What Jewelry Should I Choose for my Tragus Piercing? The tragus is the area of your ear that is located right above your earlobe and in front of your ear canal. 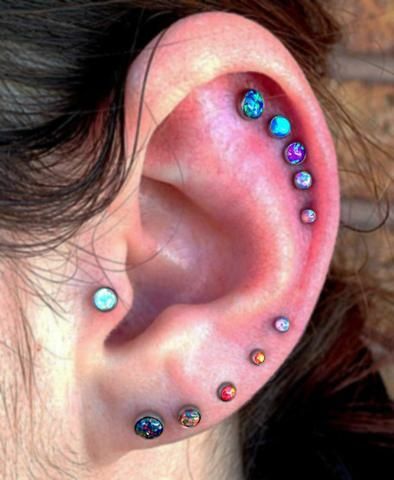 It is completely made out of cartilage and can be difficult to pierce. A couple of piercings including a tragus. Most piercers will agree to everyone coming into their shop asking for a tragus piercing. However, there are some people who are not qualified to get one. There are rare cases wherein the tragus of a person is too thin, which is not safe to put jewelry in. Make sure to ask your piercer if your tragus is good enough to go before having the piercing done. If he says no, then go ahead and choose another piercing that you think would suit you. There are only two types of tragus piercing: the tragus and the anti-tragus. If you are curious about how both piercings are done, then keep on reading. A photo of an earlobe and tragus piercing. This is the more common piercing among the two. The tragus piercing is done by inserting a hollow needle into your tragus. The piercer will first put a mark on your tragus, ask you if you are satisfied with the placement and if you say yes, he will then go ahead and proceed with the piercing. Once the hollow needle is in, the piercer will then insert your preferred jewelry into the piercing slowly. Blood and discharge are common right after the needle and jewelry go into your tragus. You will feel a sharp and stinging pain during the piercing, but that’s about it. Make sure to follow your piercer’s aftercare instructions to make sure that your tragus piercing will heal faster and properly. 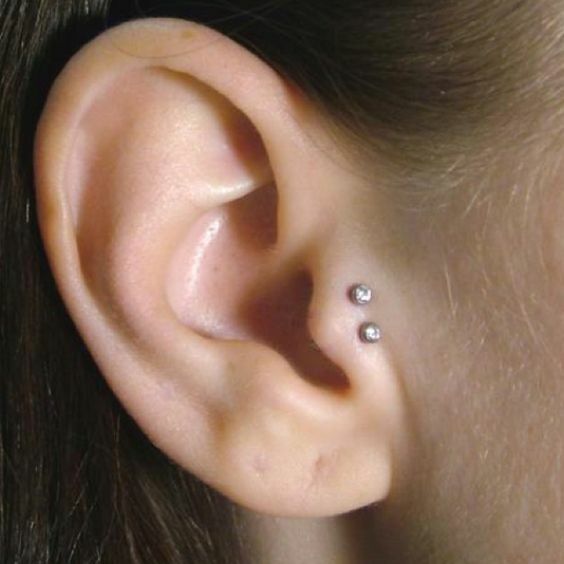 A picture of the tragus and anti-tragus piercings. The anti-tragus piercing is done on the inner cartilage of the ear. This faces the tragus, hence its name “anti-tragus”. This piercer will also use a hollow piercing needle for the anti-tragus instead of a piercing gun. 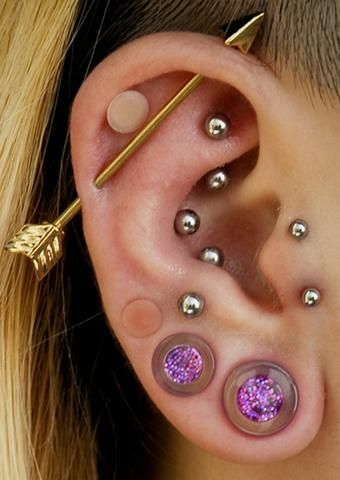 It is not a good idea to use a piercing gun for both the anti-tragus and the tragus, as the flesh on the tragus is extremely thick, which means that the gun can only contribute to the possibility of bacterial infection. Is the Tragus Piercing Pain Tolerable? The tragus is an area that does not contain many nerve endings. Simply put, this means that the tragus piercing will hurt less than other piercings such as the industrial and septum piercings. The tragus is a cartilage and is thicker than the rest of the cartilages on your ear. However, even if it is thick, it is very flexible, which is why people who choose to get pierced in this area experience less pain. During the piercing, you will feel a very sharp and stinging pain. This is usually felt when the needle passes through your tragus, and once again when the jewelry is transferred. This will only take a couple of seconds, and it will surely be well worth it right after. 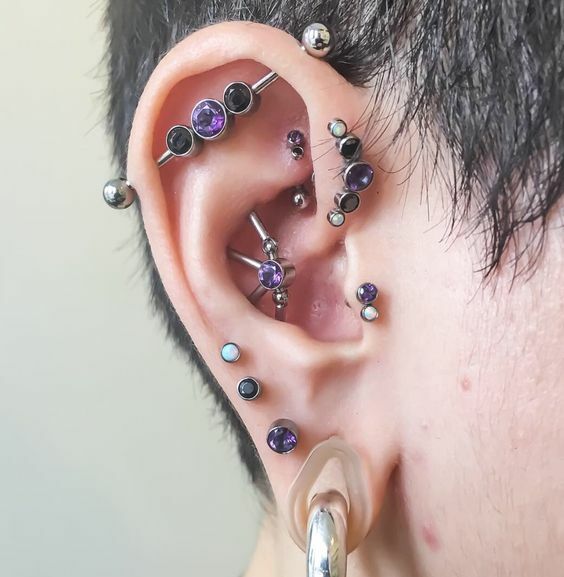 A lot of ear piercings including a tragus piercing. You will also feel more pressure when getting your tragus pierced compared to getting your earlobes pierced. This is because the tragus is much thicker than your earlobes, causing the piercer to use more force when piercing it. A throbbing effect should also be expected when getting the tragus piercing. This feeling shall pass after a day or two. If you continue to experience throbbing and tenderness, then let your piercer know about it and ask them what you should do. As we have mentioned earlier, you will still feel a bit of throbbing and tenderness even after the piercing is done. You can expect to feel this for a couple of days after the piercing, which will also usually be accommodated with redness. If the throbbing, redness, and tenderness last for two weeks or more, call your piercer and doctor right away and tell them all about it. They will tell you what to do and how to clean it. If you see any discharge or pus coming out of the piercing, head on to the emergency room right away. How Can I Lessen the Tragus Piercing Pain? There are a few things that you can do to lessen the pain during the piercing as well as after the procedure. Make sure to follow each one to make sure you’ll be all good. Before the day of the piercing, make sure to get at least eight to ten hours of sleep. There is a high chance that your piercing will hurt more if you are not well-rested, as the body tolerates pain better when it is well-rested. Think of it as recharging or refueling. Going into the piercing shop when you are feeling unwell is not a good idea. You have to be a hundred percent healthy before you get the piercing, as being sick can affect the healing time and period of your piercing. Drink your vitamins and medicines regularly and if you are sick, wait until you get better before getting pierced. Alcohol is a natural blood thinner, therefore, if you drink the night before or right before your piercing, you will experience an extreme surge of pain and more blood will come out of it than usual. Most piercing studios also would not allow you to get pierced while you are under the influence of drugs and alcohol, which is why it would be best to stay away from it before you get the piercing. 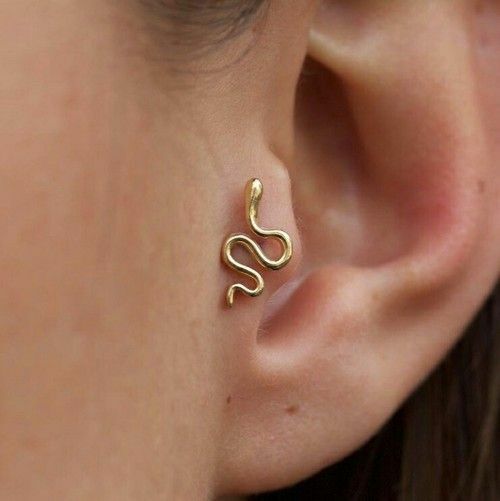 If you are too scared of the pain but you really want to get the piercing, then ask your piercer if they have a good numbing product that you can use. This will definitely lessen the pain, to the point that you won’t feel anything at all. Ask your piercer to not use a spray that will freeze the area, as this can increase damage to the tissue and can affect the healing time of your piercing. Instead, you can use a numbing cream which is safer to use for piercings. The piercer’s technique will definitely affect the pain during your piercing. Do your research and find a piercer that is reputable and qualified to do the piercing. Ask for recommendations from your friends and ask them if they’ve had a good experience with the said piercer. It would also be best to look for a piercer that has done several tragus piercings in the past before. Going alone to the shop can make you feel more anxious and nervous. Bring a friend along so you can have someone to talk to and distract you during the piercing. You can also listen to music and sing along to the lyrics, or talk to your piercer and make new friends! Hype yourself up and think about the end results of the piercing. This will make you feel more excited than nervous and determined to get that piercing. Remember that the sting will only last for a few seconds; after that, you will finally have the piercing that you’ve always dreamt of getting! Wearing tight clothing can only add pressure to your body and your nerves. Make sure to wear loose and comfortable clothing so that you can move around and feel more relaxed during the process. You should also be careful not to tug the clothing on your piercing when taking it on or off, as this will irritate the piercing and can prolong the healing process. Eating less or nothing at all can contribute to low blood sugar. Having low blood sugar can make your skin and nerves more sensitive, causing you to feel the pain more. This can even cause you to pass out, especially if the pain is too extreme for you. Eat before getting pierced to avoid being nauseated and having low levels of blood sugar. Read up about the tragus piercing and know how much the pain level will be so you would know what to anticipate. Ask your friends that have undergone the same procedure before and have them describe the pain during and after the piercing. It pays to be knowledgeable about these things, so go ahead and do your research before sitting in the piercer’s chair. How Much will it Cost me to Get a Tragus Piercing? 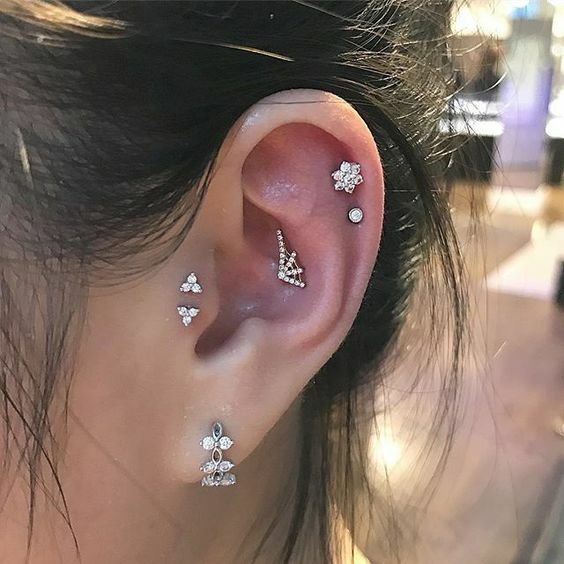 Although different parlors and piercers will charge differently based on their experience, reputation, and technique, and skills, the general range for the tragus piercing is not that high. It will cost you about $25 to $50 to get one ear pierced. 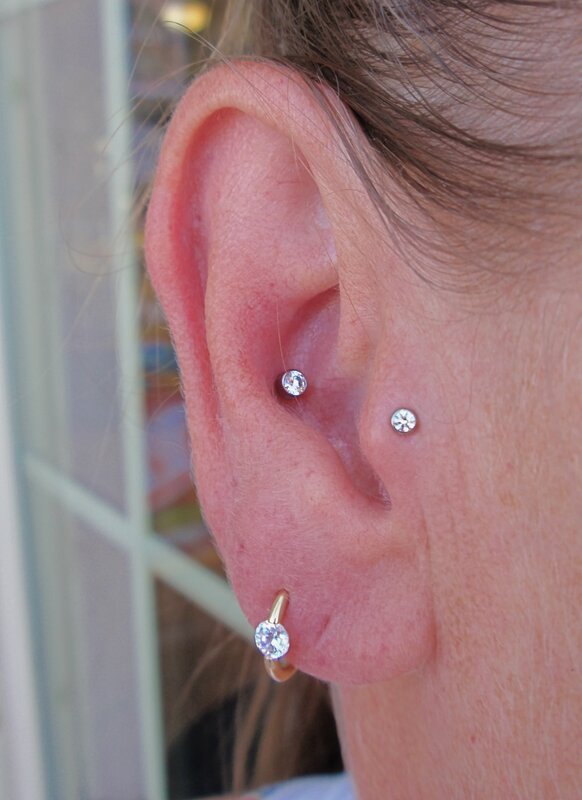 A beautiful jewelry used for the tragus piercing. If you decide on getting a fancier earring though, the prices will be much higher. Getting high-quality earrings with precious metals and fancy stones will cost way more than just getting a plain stainless steel hoop earring. Cleaning your tragus piercing is important, as this eliminates the risk of getting an infection. It also speeds up the healing process and helps you get right back to your normal routine faster. There are ready-made solutions that you can buy at your piercer’s. These are usually made of sea salt, which you can also make in your own home. To mix your own saline solution, mix ½ teaspoon of sea salt into one cup of water. Sea salt is better than table salt, as it is more natural and less processed. Mix it until the sea salt has completely dissolved, leaving you with a hazy mixture. Next, get a cotton ball and dip it into the mixture. Place the damp cotton ball on your tragus and make sure not to rub or tug on it. Do this for about five to ten minutes and repeat twice a day. Steer clear of alcohol or any type of harsh antibiotics, creams, and topical ointments. These things can only irritate your piercing and can even lead to an infection. Stick to the sea salt and distilled water mixture until the wound heals completely. Beautiful stones used as a jewelry for tragus and ear piercings. You should also avoid putting hair products on your tragus piercing. If you usually reach for a hair spray, a gel, or clay, then make sure to never get these things on your piercing. Again, this can irritate it further and will probably cause an infection. Sleeping on the side with your newly pierced tragus piercing is also a bad idea. Make it a conscious habit to sleep on the side that you do not have the piercing on, so your tragus piercing would not be irritated. This is the reason why it is a bad idea to get two piercings at a time. If you see any crusts forming on your piercing, avoid picking on it. Just grab the saline solution and a piece of cotton and clean it gently. When will my Tragus Piercing Heal Completely? For most people, the healing time for the tragus piercing is at around three to six months. If you are diligent enough to follow the aftercare guide though, your piercing will heal faster – as fast as two months for some. Another thing that can slow down your healing process is an underlying illness or disease. If you have diabetes, then chances are you already know that wounds heal slower when you have this certain illness. The best thing that you can do is to ask your doctor if it is safe to get the piercing. A beautiful flower-designed jewelry used for the tragus piercing. Unlike with frenulum piercings, piercing migration is not that common with tragus piercings – however, it is still possible. The best way to avoid this is by steering clear from any type of jewelry that you know you are allergic with. Nickel is a usual irritant for most people, so make sure to stay away from jewelry containing nickel. Lastly, avoid playing with your jewelry and replacing with a new one even before it heals. This can lead to certain infections, which you definitely want to stay away from. You can only replace the jewelry once the wound is fully healed, which is around four to six months after getting it pierced. There are things that you can do to prevent your tragus piercing from contracting an infection. Make sure to read each one to know how to avoid it and what to do when you get an infection. The tragus is heavily filled with cartilage, which is what makes it tricky to treat when infected. You certainly do not want this happening, so you should make sure to clean your piercing with the saline solution twice to thrice per day. An example of dermal tragus piercing. Avoid touching it and never let your friends or other people touch it, as the bacteria and germs can easily contaminate your piercing. If you can, always set your phone to speaker mode when talking to someone. Do not put it over your newly pierced ear, as your phone is full of bacteria which can easily harm your ear. During the healing process, remember to never scratch your ear when it is itchy. It would be best to leave it alone no matter how itchy it gets. 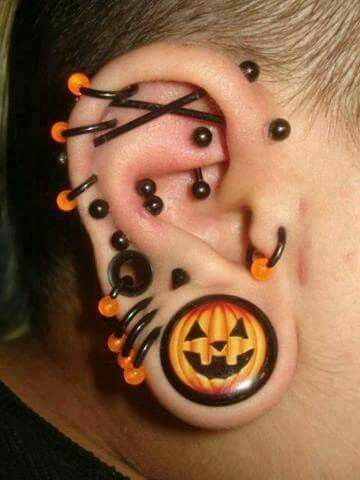 If it gets unbearable, call your doctor and your piercer and ask them the best course that you can take. If you see that your tragus is inflamed, has bumps, and is extremely red in color, then it is time to call your doctor. This is most likely a sign of an infection and you should do everything to get rid of it. Tenderness and throbbing pain are common during the first two to three days after the piercing but if it lasts more than that, then it is a thing that should definitely worry you. Other things to watch out for are fever and pus and bloody discharge from your piercing. If these things start to show, then head on to the emergency room and have yourself seen by a doctor right away. Although the risks of getting an infection after getting a tragus piercing are small, it is still important to clean your ear and avoid contaminating it. Beautiful stones used for ear piercings. Getting a piercing on a cartilage also puts you at risk of getting a hypertrophic scar. These are scars that look like keloids and are very visible to the human eye. It is very difficult to get rid of and may require some form of surgery to do so. Another thing to watch out for is the type of jewelry to be used for the piercing. Your piercer should never use an extremely small jewelry, as this can cause so much pressure on your tragus and can cause it to balloon. This can be very painful and in some cases, the jewelry needs to be cut up. This is why it is important to choose a quality and reputable piercer to avoid these types of things. 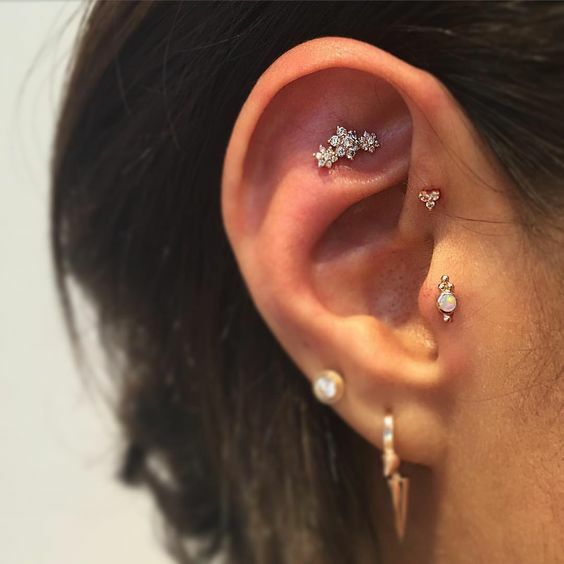 What Jewelry Should I Choose for my Tragus Piercing? The jewelry will totally depend on your own preference. 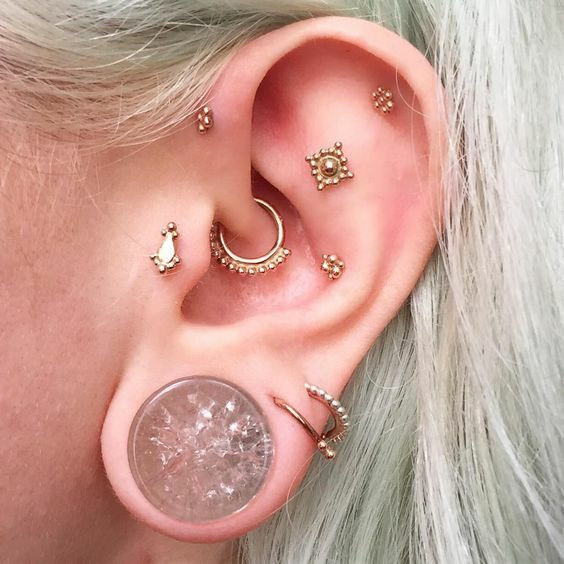 Starter tragus jewelry will usually involve a fourteen to sixteen gauge micro curved barbell ring, but you also have the independence to choose from rings, studs, and barbells. Studs are usually chosen by women because of their natural charm and stylishness. These also prevent blockage to the ear canal and when you are wearing a stud, you will feel like you are not wearing anything on your tragus at all. You can choose a ring for your tragus piercing, but you have to be careful not to tug on it or get it caught up in your hair or clothes. For rings, you have the freedom to choose from beaded rings, segment rings, ball closure earrings, circular barbell rings, and many, many more. Barbells are usually huge in size, which is why you should wait for your tragus piercing to completely heal before replacing your earring with one. These are exotic adornments that are available in different patterns and designs. Before getting the barbell earring, visit your piercer and ask them if it is safe to replace your current earring with it. Better yet, you can ask your piercer to do it for you or assist you while doing it. 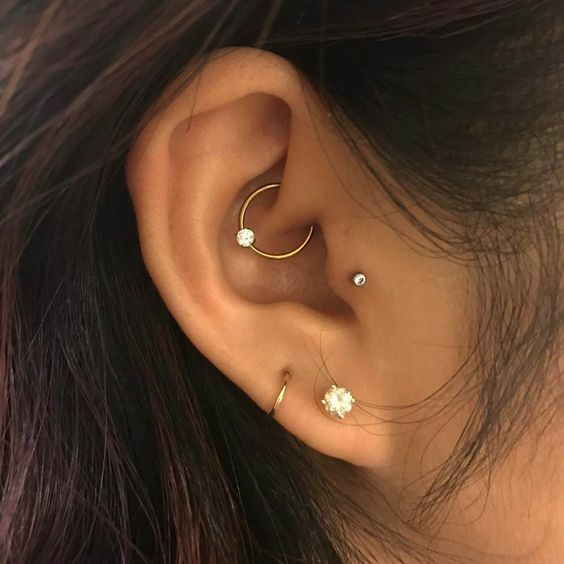 We have compiled some of the best photos regarding the tragus piercing, so make sure to check them all out for your inspiration! Beautiful earrings for different ear piercings including a tragus. A whole lot of ear piercings including a tragus and anti-tragus piercing. 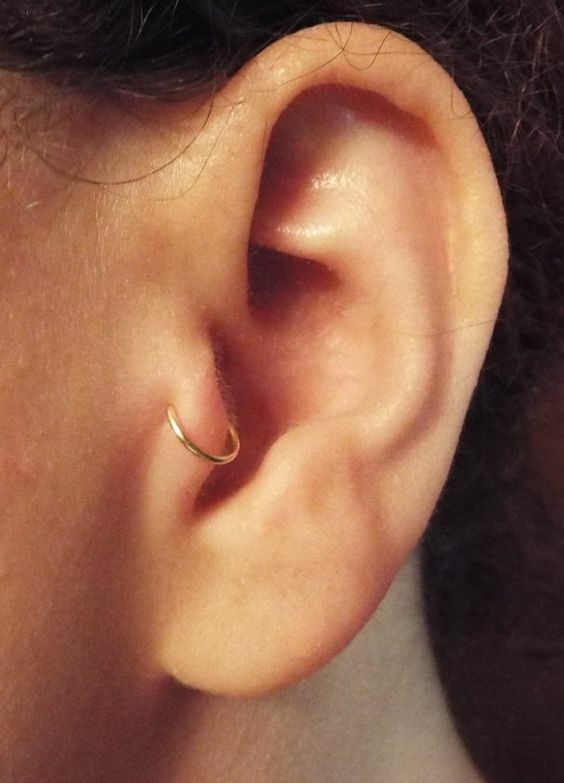 A simple tragus ring for a tragus piercing. A small and simple stone jewelry for a tragus piercing. 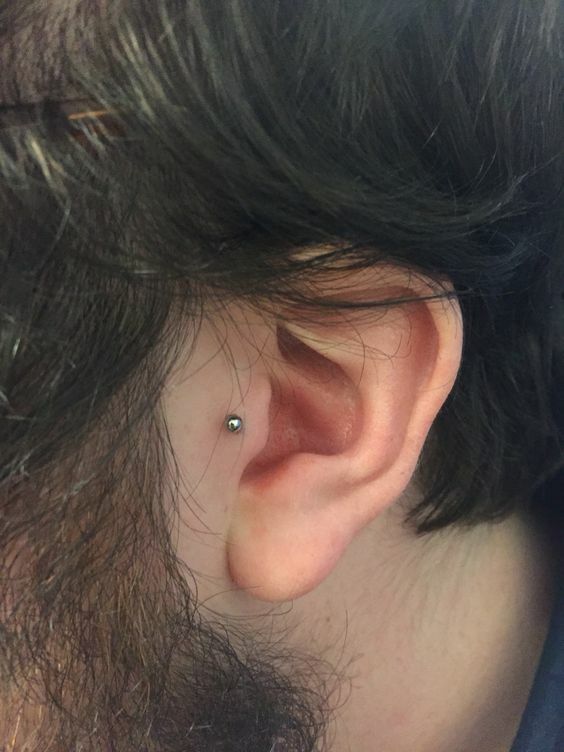 A very beautiful yet simple tragus piercing done on a male model. 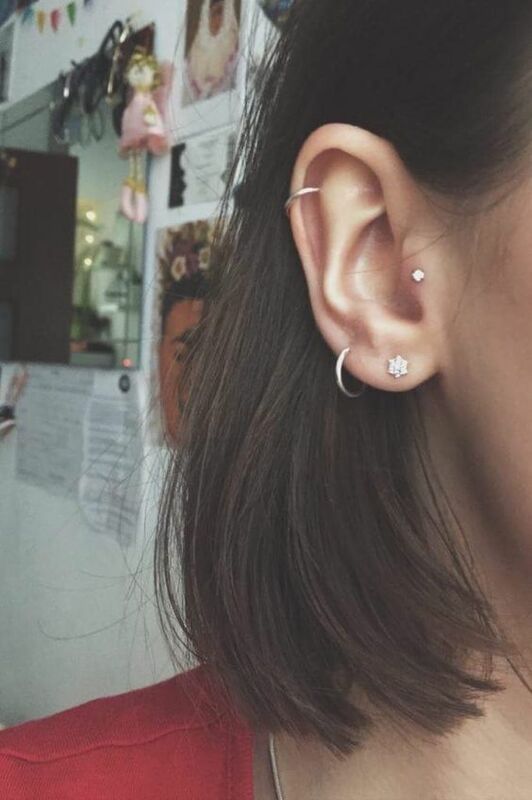 A very simple double tragus piercing. Famous Hollywood actress Scarlett Johansson donning a tragus piercing. Tragus piercing done on a man. A small type of jewelry used for a tragus piercing. 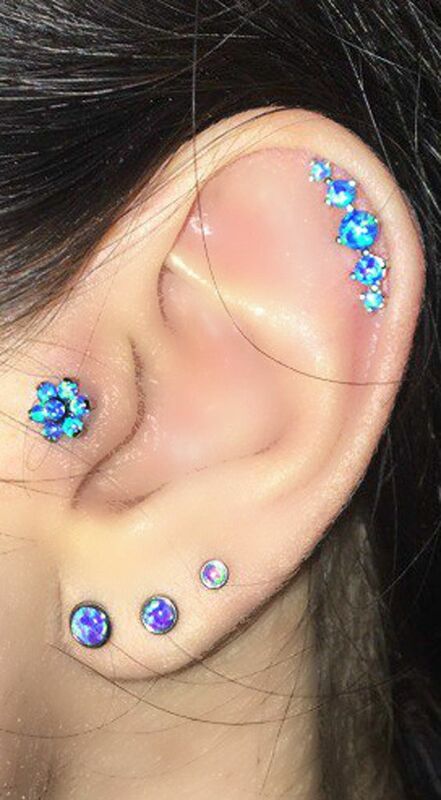 Very pretty ear piercings including a tragus piercing. Tragus piercing on a woman.